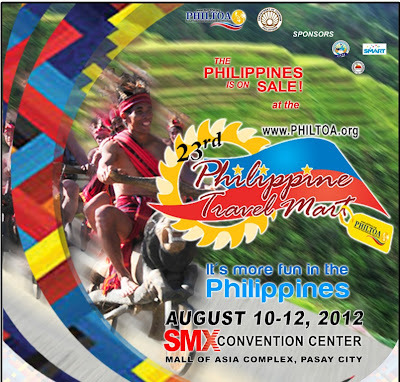 You can now plan your travels by checking out the 23rd Philippine Travel Mart (PTM) at the SMX convention Center in Pasay City on August 10-12, 2012. Now bigger than ever, the Philippine Travel Mart is the longest-running travel trade show in the country set to showcase the Philippines in the upcoming Sale ng Bayan. Featuring heritage and eco-adventure tours from all over the Philippines, the 23rd PTM is the result of various familiarization and exploration trips that bring new tour products into the market every year. The annual event is organized by the Philippine Tour Operators Association (PHILTOA), in cooperation with the Department of Tourism. With almost 250 exhibitors presenting their tour products through colorful pavilions and booths, the Sale ng Bayan will also launch “Philippine Island Fun Caravan Getaways”—joint group tours that cover various locations from all over the Philippines. These 4-day to 8-day tours pool local, balikbayan, and foreign tourists together to avail of special packages that would have otherwise cost a lot of money if done individually. Featured tours include the Batanes-Cagayan Northern-scape, Cordilleras Cultural Weekend Warrior Caravan, Central Visayas Backdoor tour, and the Tuna-T'Boli trail, among others. Aside from the endless array of tour products in the country's biggest gathering of tour operators, the PTM will also provide informative seminars for students dubbed as Byahe-info. Also scheduled is an Eco Chorale Competition, a Folk Dance Competition, and even a Tourism Quiz Bee—ensuring educational activities for everyone in attendance.